Redshirt freshman Jerrod Heard provided a lot of reasons for optimism among Longhorn fans in his debut as UT's starting quarterback (Chris Covatta/Getty Images). Texas football's future is wide open after a 42-28 win over Rice. What can be expected this season? If anyone can answer that, then get him or her a 1-900 number because that person is the next Miss Cleo. What can be said is that redshirt freshman quarterback Jerrod Heard has, in a single game, opened eyes of both Texas fans and opposing defensive coordinators. Heard broke out in his first collegiate start with 120 passing yards, 96 rushing yards, two touchdowns and no turnovers. 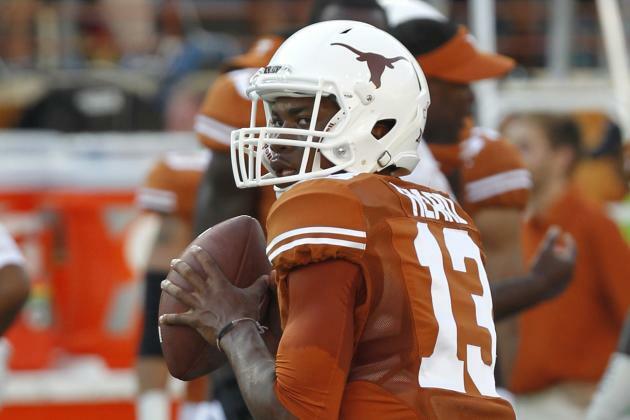 We understand that this was a single performance against an opponent slightly less formidable than the TCU Horned Frogs or Baylor Bears, but that doesn't change the fact that Jerrod Heard has emerged as the premier option at quarterback for the Texas Longhorns. Here are five reasons Heard, the multi-dimensional play-caller, should be the face of Texas now, and perhaps for the future. Talk to any player on the team and they'll tell you that Heard, like Phil Collins, has been waiting for this moment for all of his life. But Texas head coach Charlie Strong said it best.